Beards are IN here in Boston. It's October and the Red Sox are in the World Series! And some would argue that the beards are what got them there. 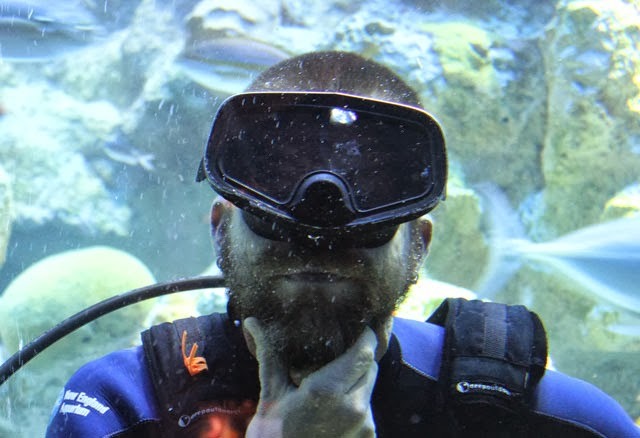 So, no better time than now to feature our only "bearded" fish in the Giant Ocean Tank. 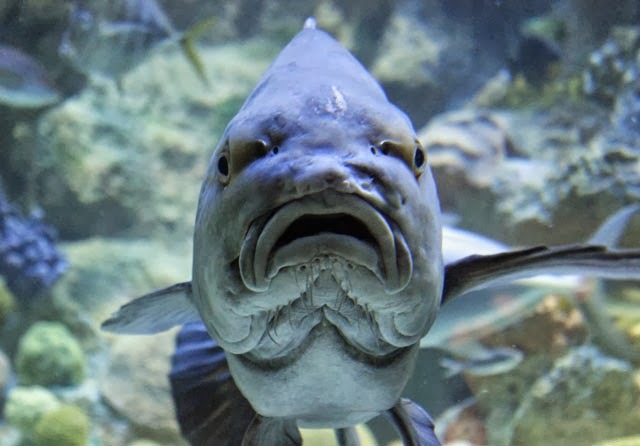 Meet our black drum (Pogonias cromis), Toronto—named after the Toronto Zoo where he lived before coming to us in 2006. He is a medium size drum right now, he'll likely grow to be bigger. 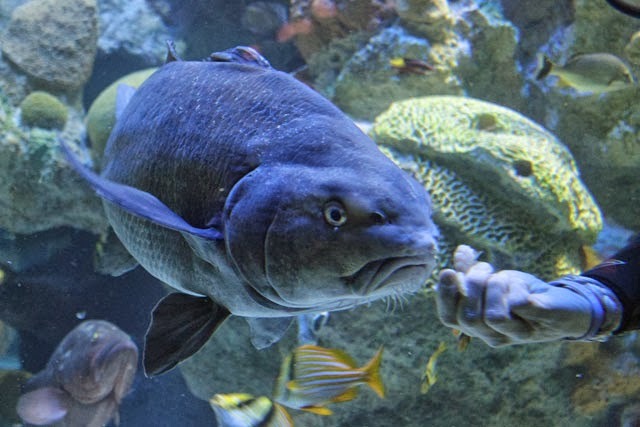 Black drums are the largest in the drum family and others have grown to be 4 to 5 feet long in the Giant Ocean Tank. 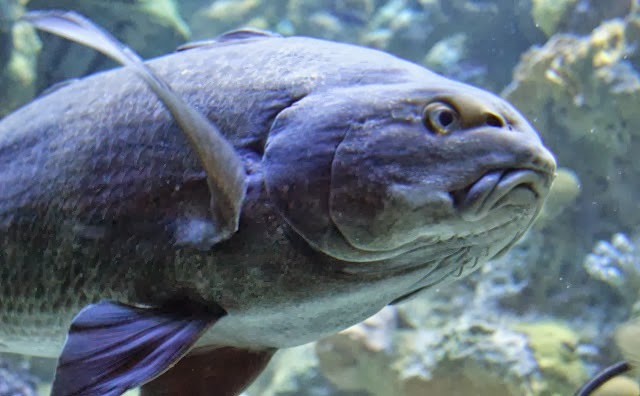 His "beard" consists of about a dozen dangling chin barbels, which are sensitive and used to sort through the substrate to find food. Toronto doesn't really exhibit this behavior in the GOT, as he's gotten used to being hand fed. He likes shrimp and squid and small fish. Toronto will be keeping his beard... go Sox! Good times to see this fellow are during the feedings with the whole fish bucket (when we serve the fish he likes) which happens at 11:15 am, 2:30 and 3:30 pm. 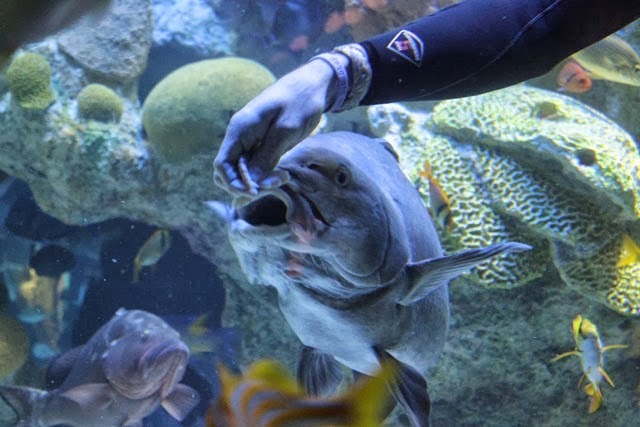 When it's not feeding time, he typically hides out of the public eye but you might catch a glimpse of him cruising along at the bottom of the tank. We'll have more videos of Toronto in the tank going up on the blog very soon. Stay tuned!